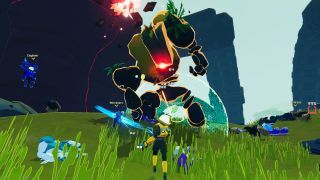 Risk of Rain 2 is all about hoarding items and decimating increasingly ridiculous numbers of enemies, but ever since the game's launch last month, one enemy type has been spoiling some of the fun: blazing enemies. Happily, Hopoo co-founder Paul Morse tells me that a blazing rebalance is on the way. For the unfamiliar: blazing enemies in Risk of Rain 2 deal ticking fire damage whenever they hit you, and this stuff ticks like a baseball card in the spokes of the fastest bicycle on the planet. It absolutely melts - to the point that a single hit from a blazing enemy can spell certain death on higher difficulties. This can abruptly ruin an otherwise enjoyable run, so players have been asking for blazing enemies to be nerfed for over a week. Those players will be happy to hear that an upcoming Risk of Rain 2 update will not only tone them down, it'll also fix a bug affecting one of the greatest offenders. One blazing enemy, the Stone Titan, was apparently dealing 2400% more damage than it was supposed to, just in case you were wondering how those things were deleting you. So yeah, that's going to be fixed. "We also made the blazing in general more balanced and fair going forward in all cases," Morse explained. "And we now show the number of stacks of [fire damage] you have as a debuff so players can see why they are getting hurt over time." As a Huntress main who's seen way more than one promising run go up in flames, I can't wait for these changes to take effect. Here's how to complete every Risk of Rain 2 character unlock.